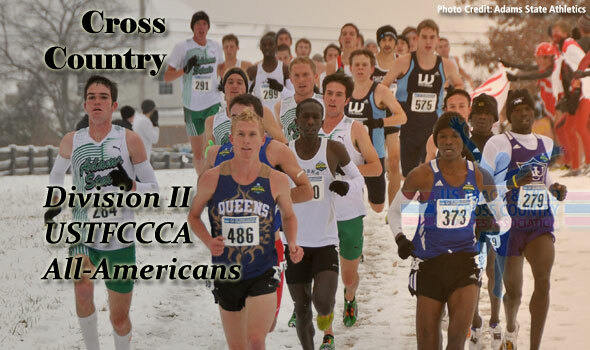 NEW ORLEANS – The U.S. Track & Field and Cross Country Coaches Association (USTFCCCA) announced on Monday the 80 student-athletes that received All-America honors for the 2010 NCAA Division II Cross Country season. Overall finish at the NCAA Championships is the determining factor as the top 40 individuals from both men’s and women’s races earn All-America plaudits from the USTFCCCA. Adams State’s men won their third-straight NCAA team title on Saturday and all seven Grizzlies that participated earned All-America status with top 40 finishes. Senior Brandon Birdsong led the school with a fourth-place finish, followed by Ryan McNiff who placed sixth. Western State, who placed second in the team battle, finished the season with five All-America honors. Chico State’s Issac Chavez was the lead freshman with a fifth-place finish in the men’s race. Overall, the RMAC led all conferences with 16 of the 40 All-America honors going to member schools. The GLIAC and GNAC followed with four apiece. On the women’s side, Grand Valley State won their first women’s cross country NCAA team title in school history. Led by senior Katherine McCarthy’s fourth-place finish, the Lakers notched All-America honors for each of their seven runners. Western State notched five All-America honors as the team finished second overall. The GLIAC and RMAC each had nine women earn All-America honors to lead the conference count. On Tuesday, Division II’s National Athletes and Coaches of the Year will be named.